Happy New Year to all my Brothers and Sister of every faith and race and creed around the world! May God bless you all this year with health, happiness, love and wisdom. I can think of no better resolution for the New Year than to repeat this beautiful prayer. 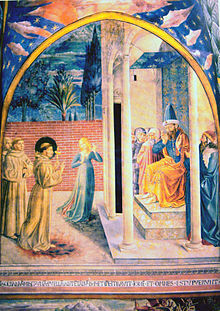 St. Francis di Bernadone, born in 1182 in Northern Italy, is popularly known and loved as the poor, generous, traveling friar who talked with birds, tamed wild beasts and sang the “Canticle of Creation.” But Francis was once also an inter-religious emissary of peace and nonviolence. Francis lived in the political turmoil of the 13th Century “Holy Roman Empire,” locked in a culture of war, fought both within the empire as city fought city and without, as the empire united in a series of Crusades against Moslems, Jews and “heretics.” It was during the fifth crusade, in 1219, that Francis began an amazing journey that directly opposed this culture of war and enmity. Christians in his time viewed The Crusades as holy; a complete reversal of the first 300 years of Christianity when disciples of Jesus would not participate in any killing. In response, the Sultan of Egypt had decreed that anyone who brought him the head of a Christian should be rewarded with a Byzantine gold piece. Francis began his prophetic resistance to the violence of the Crusades by meeting first with his own religious leaders, begging Cardinal Pelagius, the Christian commander, to stop the fighting. Pelagius refused. Francis then took a companion, Brother Illuminatus, and set out, unarmed and filled with love for his “enemy” brother, to visit the Sultan of Egypt, Malik-al-Kamil, the nephew of Saladin. The men of the Sultan’s army captured Francis and Illuminatus and dragged them, beaten and exhausted, before the Sultan – just as Francis had wished. Francis’ enthusiastic desire to share his “good news” with the Sultan, without insulting Islam or refuting Mohammed, was unique and disarming. In the encounter between them, both Francis and the Sultan were changed. When Francis finally left to return to Italy, the Sultan showered him with many gifts and treasures. Because he had no interest in worldly wealth, Francis refused them all, except one special gift: an ivory horn used by the muezzin to call the faithful to prayer. On his return, Francis used it to call people for prayer or for preaching. Francis also shared with his community his new and deep respect for his Moslem brothers and sisters, breaking down the cycle of enmity and misunderstanding that fueled the Crusades. Francis was especially struck by the Moslem five times daily prayer, and the practice of prostrations in worship of God; his letters urged Christians to adopt a similar practice: To make prayer a part of everyday life, in effect to remember God in everything you do, as in the Sufi zekr. Stories of the time told about the change in the Sultan after his encounter with Francis. He placed Francis under his personal security and provided safe-conduct through Muslim states. From then on, several accounts relate that he treated Christian prisoners of war with unprecedented kindness and generosity. Francis lives out the core of the Christian mandate: to love one’s enemies, to reach out in respect to those of other religions and cultures. Meeting the sultan confirmed to Francis that we are all brothers and sisters. Neither converted the other and yet they met each other as men of God. And their meeting appears to have changed more than Francis and the sultan. Almost immediately we see some iconography in the eastern world showing these two men. One of the sultan’s own spiritual counselors (a Sufi), it was said, had engraved on his tomb that what changed his life was the meeting between a Christian monk and the sultan in his tent. Our darvish brother David has written a very good review of Master of the Jinn: A Sufi Novel on his Caravan of Dreams blog. You can read it HERE. David is also suffering from a bout of Sickle Cell Anemia, so please visit his blog and send him your prayers and blessings. You are currently browsing the Darvish blog archives for December, 2008.